The Pixel 2 and Pixel 2 XL may have leaked today, but we've still got around two weeks until they officially launch. So if you need a 2017 phone running Android 8.0 Oreo, you currently have one option: the Sony Xperia XZ1. 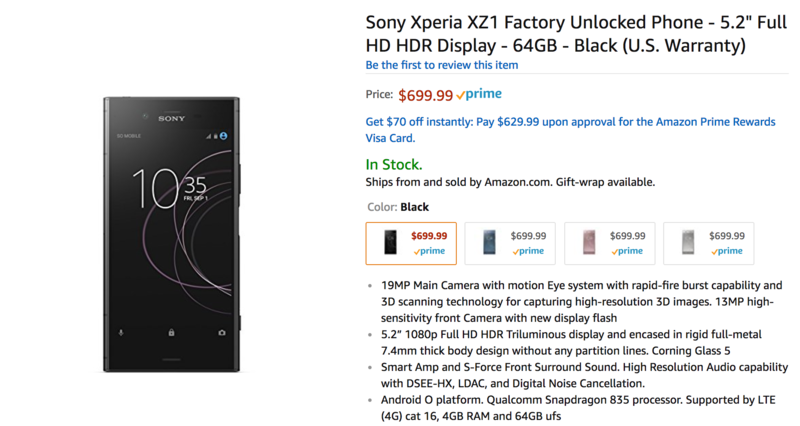 That's right - the first phone to ship with Oreo isn't a Pixel, or even a Samsung or LG; it's a Sony. The XZ1 debuted at IFA, and our team had a look at both it and the XZ1 Compact. It sports a 5.2" 1080p IPS display, a Snapdragon 835, 4GB of RAM, 64GB of storage, a 19MP rear-facing camera, a 13MP front-facing camera, and a 2700mAh battery. Plus, this is the very first phone to ship with Android 8.0 Oreo, which is pretty sweet. It's also one of the only phones that's Netflix HDR-compatible. If you can deal with a 1080p display and the higher $699.99 price tag (keep in mind that the Pixel 2 with 64GB is $649), this may be worth a look. It's available on Amazon right now in four colors: Black, Moonlit Blue, Venus Pink, and Warm Silver. Those of you in the UK won't have to wait long; the phone is slated for a September 22nd release there. Check the source links to grab an XZ1 of your very own.